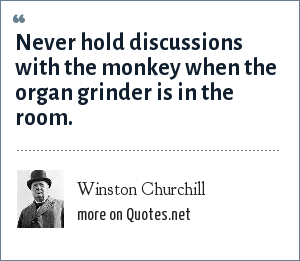 Winston Churchill: Never hold discussions with the monkey when the organ grinder is in the room. "Winston Churchill Quotes." Quotes.net. STANDS4 LLC, 2019. Web. 18 Apr. 2019. <https://www.quotes.net/quote/5819>.